Since I haven’t had much opportunity to explore homes in the small community of Northwood II, I decided to visit a townhouse today at 20 Shadowplay. 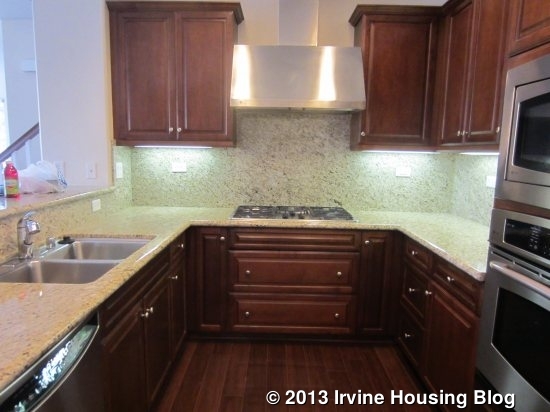 This corner unit is currently for sale, but the owners will also consider leasing the property. It is already vacant and in move-in condition. HOA dues are $291 ($142 + $149) per month and there are Mello Roos taxes. When you enter the house, you walk right into the living room, without having any true entryway space. 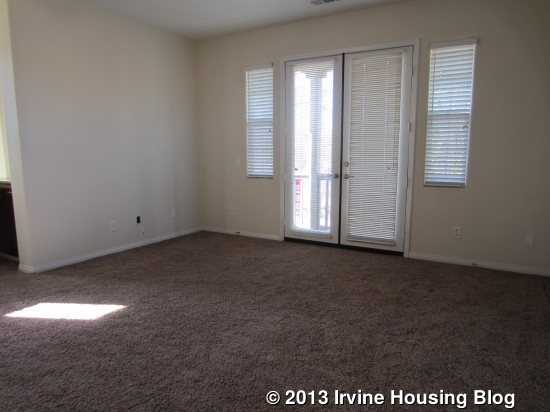 The room is cut at an angle with a fireplace in one corner and has a cutout space for a TV. 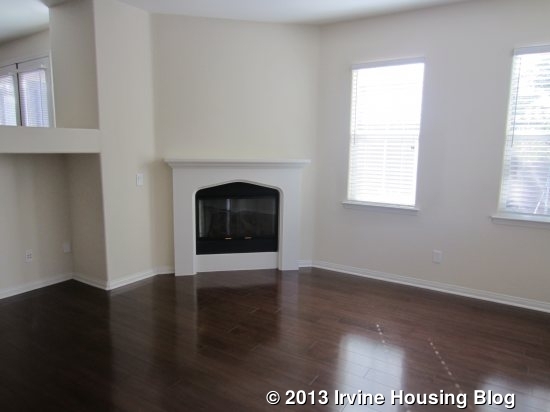 The dark hardwood floors offer a nice contrast to the white fireplace and light-colored walls. 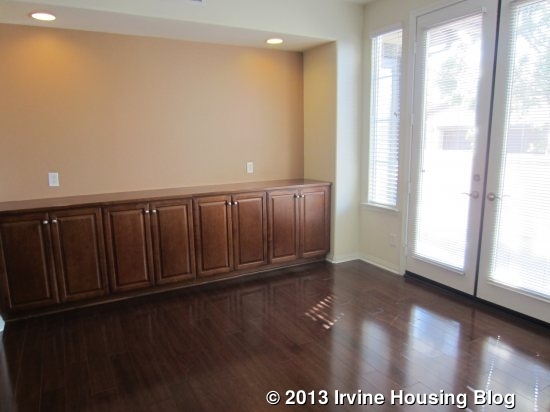 Beyond the living room is a large dining room that includes a full wall of cabinets. These will come in very handy, as the kitchen is fairly small and doesn’t have a lot of storage. The dining room is wide, with space for a large table, and also has access to the side patio. The kitchen is next to the dining room. 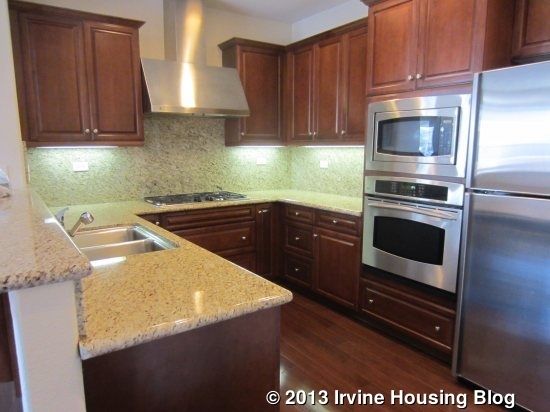 It has granite countertops, dark wood cabinets and stainless steel appliances. 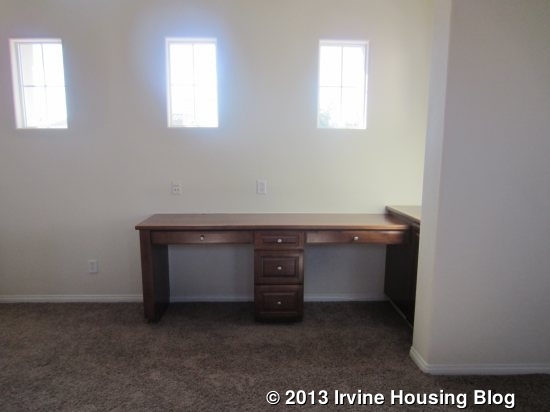 It doesn’t offer a lot of storage space and has limited counter space available for prep work. 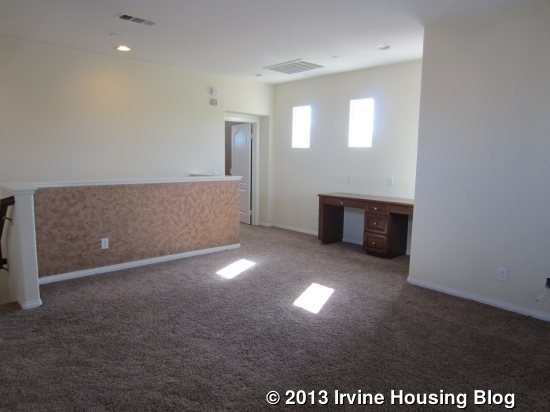 It does have a large pantry and lesser-used items can be stored in the dining room. There are two bedrooms downstairs – one at the front of the house and another at the back. 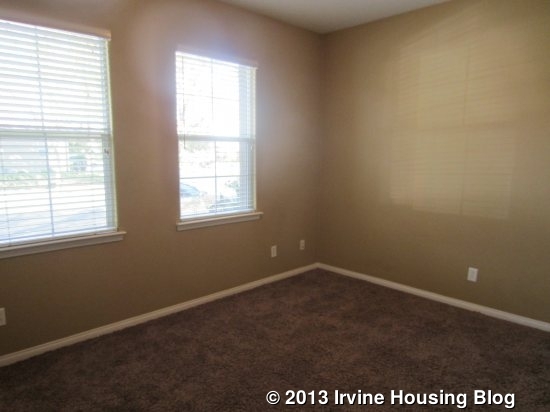 The room at the front is a basic room, with dark brown carpeting, two windows, and a small closet. 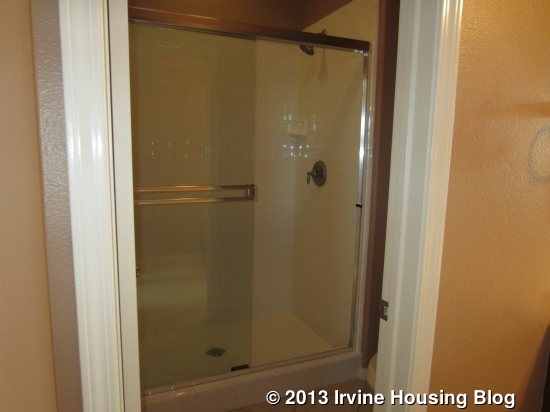 It is adjacent to a full bathroom that has a shower (no tub) and doubles as the downstairs powder room. 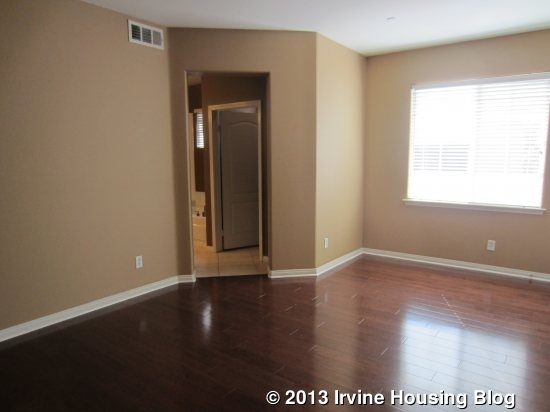 At the back of the house is the downstairs master bedroom. 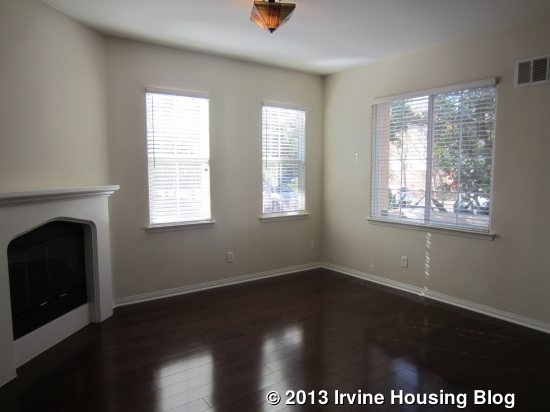 It has hardwood flooring and access to the side patio. 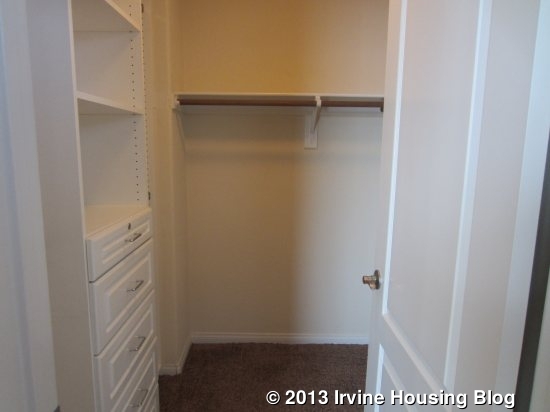 It’s kind of an odd shape that doesn’t lead to many options in furniture placement, though built-ins in the walk-in closet may eliminate the need for a dresser. 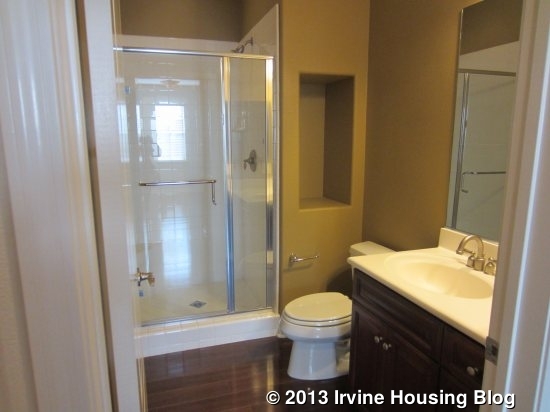 The bathroom is nice, with split sinks separated by a vanity, a large tub, and a good-sized shower. 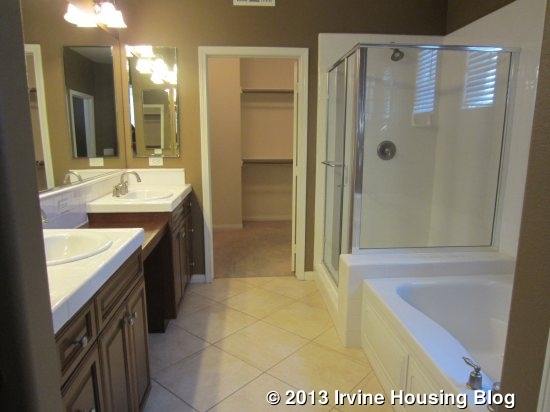 The counters and shower are tiled in basic white, but are clean and well-maintained. 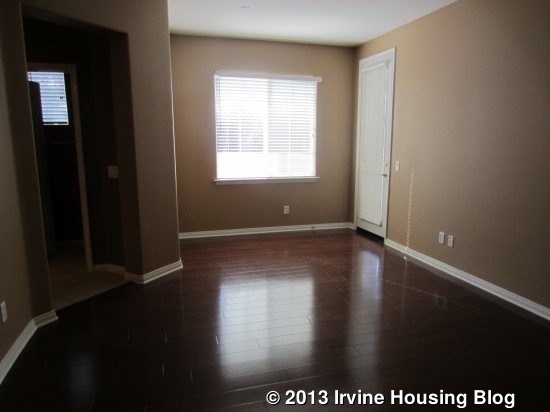 Also downstairs are a laundry room (no sink) with access to the garage and a small coat closet. At the top of the stairs is a large loft area with access to a balcony overlooking the street. It’s among the largest lofts I’ve seen and could probably be divided into a couple of different spaces. It has a built-in desk with two small work stations off to one side. Beyond the loft is the upstairs master bedroom. It is long and rectangular and feels a little bit bigger than the one downstairs. 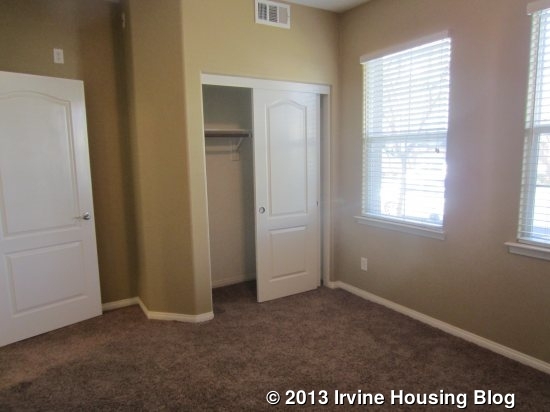 However, it has a smaller closet and bathroom. 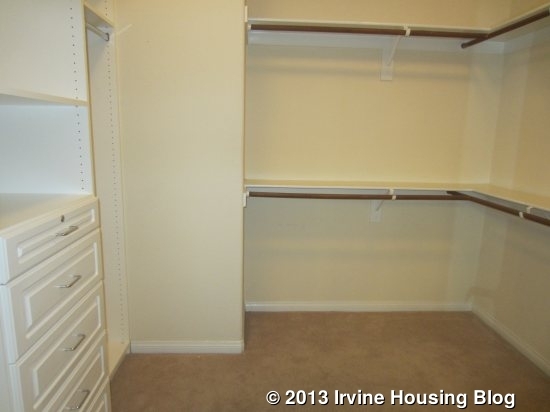 The closet is still a walk-in with built-ins, but offers less hanging space than the one downstairs. 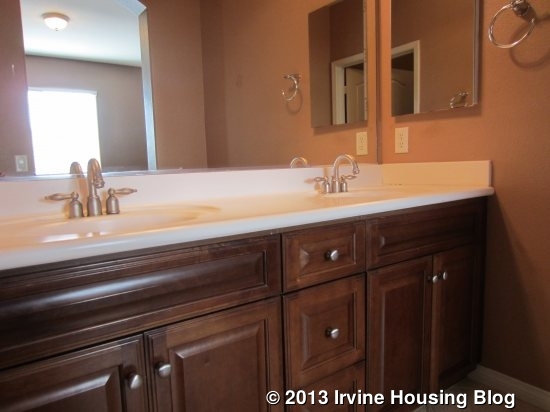 The bathroom has two sinks, but no vanity, and a shower but no tub. The room is more private than its downstairs counterpart, but less elegant. 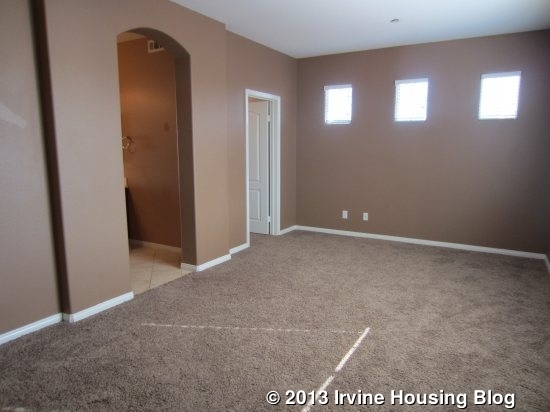 Overall, I felt like the living room and kitchen leave much to be desired. They are both small and the living room doesn’t really open up to the kitchen, so you are more secluded than in the wide open great rooms that are common in most new construction. Also, while I like having two master bedrooms, I wish the more elegant one was upstairs. I loved the large loft and thought it was a great added living space. Because it’s a townhouse, there are two sets of HOA dues, and both are higher than in many other communities. 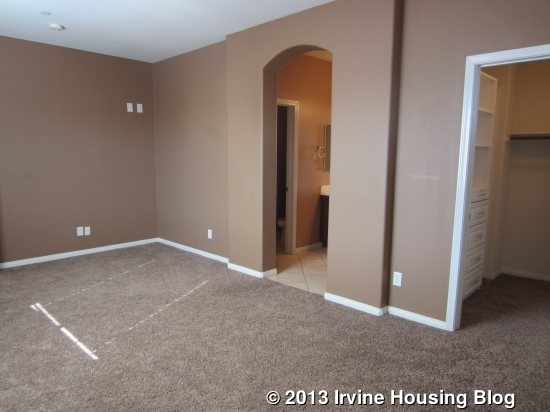 It is pretty big for a townhouse, but the high fees and overall layout would deter me from making an offer. 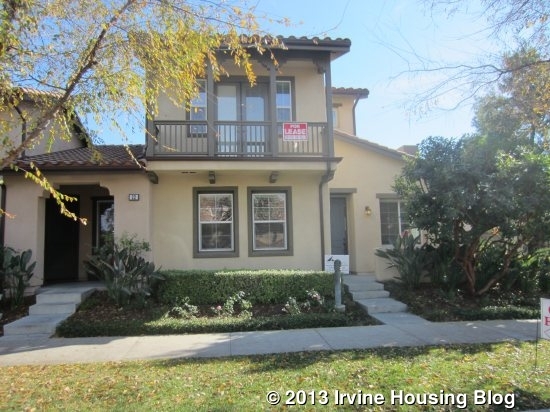 This entry was posted in Real Estate Analysis on January 17, 2013 by Karen.